We all want to maintain that fresh, glowing face we first saw in the mirror as youths. Collagen injections may be one way to rejuvenate sun-damaged or aging skin. Your skin contains multiple layers. Just below the outer layer (epidermis) is the second layer, called the dermis. This layer has blood vessels, nerves and hair follicles, but it’s mostly made up of a protein called collagen. Collagen is a key support structure in your skin with its network of fibers that provides a framework for the growth of cells and blood vessels. Collagen also is found in cartilage, teeth and bones. Medical science has harnessed the value of this natural protein and surgeons now use a variety of collagen fillers to ease the signs of aging, fill scars and add volume to enhance the appearance of your face. Collagen fillers were the first type of dermal fillers on the market to be used in aesthetic procedures. One of the most popular treatments is collagen lip injections. Injectable collagen formulas derived from human sources include, Cosmoderm and Cosmoplast. Zyderm and Zyplast are forms of purified bovine collagen that, unlike human derived collagen, require allergy testing. Evolence is a dermal collagen filler made from purified porcine (pig) collagen and also requires an allergy test. A hybrid form of collagen is Artefill (known in Europe as Artecoll). This is a mixture of bovine collagen and homogeneous polymethylmethacrylate microspheres, which are tiny plastic spheres. Those spheres not only create a desired new look, but they also stimulate natural collagen production. Another key source for collagen fillers is your own body. Autologen is collagen from your own skin, which is harvested during a previous operation and processed into liquid form. If you have a tummy tuck or another operation in which skin is removed, your skin can be used to extract collagen. It’s then sterilized and prepared for re-injection. Your processed liquid collagen can be safely stored for five years and used as needed. Isolagen injection is collagen that’s also taken from your own skin, but in this method, it’s cloned in a lab and processed into liquid form. A piece of skin the size of an eraser is all that’s needed. It’s sent off to a lab and then returned to your surgeon within a few weeks. A minimum of three injections are recommended at two-week intervals. The first injection will improve your wrinkles by about 15 percent, the second injection by 35 percent, and the third injection by 70 percent. Because live cells are injected, improvement may continue for several months after the last injection. One final option is Dermalogen, a form of collagen from human cadaver skin which has been sterilized, purified and processed into liquid form. Two or three collagen injections are recommended at one- to two-month intervals to achieve the best result. Depending on the type of collagen you and your plastic surgeon choose to use, an allergy test may be required. It’s usually done a month before your first set of injections. A tiny amount will be injected and you’ll be asked to watch that spot for signs of swelling, redness, itching or anything else unusual. Call your doctor if you see any signs of a reaction. First, your surgeon will listen to your desired results and then evaluate your facial appearance and skin tone, examining the areas of your face to be augmented with an injectable dermal filler. Next, the surgeon will mark strategic points on your face as guides to the appropriate collagen injections sites for the filler. You injection sites will be cleansed with an antibacterial agent. Then a topical anesthetic will be used to numb the area, particularly if you are sensitive to injections. But in some cases, the collagen filler includes an anesthetic in the mixture. A special note about scars and deep lines. These areas will often require multiple injections to achieve your desired results. If a deeper injection is required, you’ll be offered a local anesthetic to remain comfortable. Common sites are the nasolabial folds and marionette lines, or to enhance fullness in the cheeks. You may experience some swelling and bruising for the first 24 hours following collagen injections. The area may appear red for a day or up to a week. It’s OK to use makeup anytime, just take care not to rub the treated area. Avoid strenuous exercise, sun and drinking alcohol during the first week after the injections. Call the doctor. If you experience any sort of sudden, severe pain or any symptoms that seem unusual, call your plastic surgeon immediately. Generally you can expect that the effects of a collagen injection will last about three months, though some people have reported that the effects lasted up to two years. The results of collagen injections are not permanent. Your body will eventually reabsorb the collagen, so follow-up appointments are necessary. If you decide not to re-treat, your appearance will return to its original condition. Wrinkles and scars will return, and plumped lips will lose volume. Collagen fillers will result in a natural look, improving wrinkles, lines and scars. 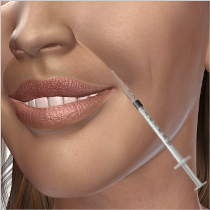 A collagen lip injection will produce a fuller appearance. If the collagen used was from human sources, the area will be overfilled and will look that way at first. But this will soon disperse to yield a more natural look. Be sure to ask questions, and don’t be shy about discussing any concerns. Am I a good candidate for collagen fillers? Who will perform the collagen injections? Have they been specifiaclly trained in this procedure? Where and how will you perform my procedure or treatment? How long of a recovery period can I expect? What are the risks and possible complications associated with my procedure? What results are reasonable for me?